Psychedelic colours, pumpkin motifs and polka dots have long shaped Yayoi Kusama’s practice – and when Life is the Heart of a Rainbow lands at the National Gallery Singapore, expect the legendary Japanese artist’s most extensive collection of works within South-East Asia yet. Alongside her Infinity Nets series, the exhibition presents 120 paintings, sculptures, videos and installations, including a recreation of Kusama’s infinity mirror rooms – most of which are replete with lashings of her famed motifs. Each is an examination of how her works have resonated across geographical boundaries, and the societal and personal challenges she has overcome to make her mark in the art world. The 87-year-old, whose avant-garde use of shapes and colour reflect the trauma and mental health issues she’s dealt with since young, continues her practice from a sanitarium where she voluntarily resides. We delve into her surreal world with these four works. 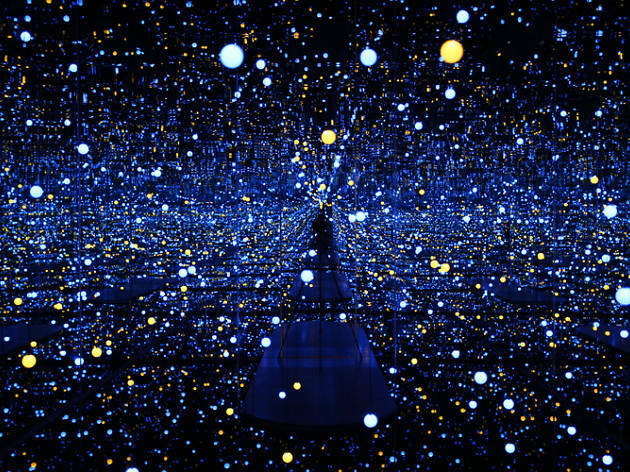 Narcissism’s the pillar of – and reason for – Kusama’s art, and in 1966’s Narcissus Garden, some 1,500 reflective spheres are arranged to form an infinite field of images. Each is distorted and smaller than meets the eye, creating a sense of discomfort for the viewer. When the installation opened, the artist sold these mirrored balls to passers-by in an outdoor set-up on the lawn fronting the Italian Pavilion. In making vanity and the ego the subject of the installation, the confrontational piece has regularly been interpreted as Kusama’s protest of the commercialisation of art. This series includes full-blown psychedelic installations that overturn the senses, and you can expect the same mind-bending elements from Kusama’s 2008 addition to the range. This new work is marked by a hundred glowing orbs suspended above the viewer that change colours – it’s so immersive, you’ll almost feel at one with the universe. The yellow pumpkin was birthed in 1981 in the form of an acrylic painting, and would go on to be one of several iconic objects synonymous with Kusama. That the squash plant is capable of growing even under unfavourable conditions fascinated the artist, and this – coupled with the plant’s unassuming appearance – was something she regarded with wonder. Don’t miss The Spirits of the Pumpkins Descended into the Heavens (2017), either: you’ll traverse infinity through the fruit’s bulbous forms that stretch into an endless sea of black and yellow. When, in 2009, Kusama sought to complete an epic painting series entitled My Eternal Soul, her intention of completing 100 canvases quickly expanded to 500 works, of which 24 are on show at the Gallery. In these works, expect far more than the motifs she’s known for. Beyond the eyes, dots and nets resplendent in her other pieces, she continues to push the boundaries through her experimentations with form and colour. 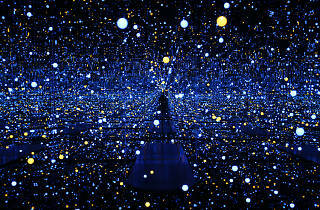 So in true Kusama style, the pieces are both surreal and humorous. The series is, essentially, a compendium of the luminary’s 70-odd years as an artist.